Over the years, if there is one mistake I have made when fishing rivers particularly early in the season… that mistake would be trying to use too light of tackle. The mistake of getting too caught up in finesse. Not using enough jig to maintain bottom contact. Getting swept off the bottom. Having the jig drift faster than the boat and having to try and catch up with the jig as it gets pulled down stream. There is always variables and exceptions to every general rule of thumb. Often, we had the mindset that we caught more walleye if we used the lightest line possible and the lightest jig possible. Thin diameter line cuts through the current better and has less bow or drag which can enhance fishing in current especially when slipping down steam or casting at angles into current seams. Use too small of a jig size however and you might be optimum for some specific current flows and boat speeds as we slip downstream, but I argue that there is often a really fine line between using not enough jig and not getting lucky. When we slip downstream or cast, we might be in the zone half the time if we error on the side of using as light of a jig as possible. Every time we come out of the seam and get in faster water, the jig gets blown up off the bottom. Every time we power upstream to slow down our slip, the jig gets blown up off the bottom. Certain angles and parts of the cast get swept up off the bottom or the increased bow in the line drops our effectiveness and efficiency. When we push our luck with jig weight, we are essentially narrowing down our ability to get lucky. Let me explain further. Tungsten can give the angler a lot of flexibility when fishing current. The new CPT 365 Drop Tg Jig Series uses tungsten on a premium long shank hook to reduce drag in the current. When we dial in the presentation too much for a specific slip speed and current flow combined with depth, whenever we get out of that precise combination of variables, we are essentially out of the zone and out of the game. Get to the end of the slip where the current kicks up and you are about ready to motor back upstream and that few minutes is wasted. Every time your boat gets sucked into deeper or faster water, your time is wasted and what I find amazing is just how often I caught fish in faster water off the seam. Over the years, my mentality started to change to where I now no longer worry about using the lightest jig possible… I now try to use the heaviest jig possible and I catch a lot more fish. When I err on the side of heavy, I get luckier. I can speed the boat up or slow down much easier without having to exactly match the current speed. I no longer have to chase the jig. I can even slowly pull upstream. I can pull out into faster water. Of course, there are exceptions where river fish will sometimes hold off the bottom and sliding upstream or downstream higher in the water column will catch fish. Some river systems will have a lot of suspended walleye patterns after big shad die offs for example. By and large however, these fish are pinned to the bottom and they are often close to the seam. The majority of fish will often nose right to the edge of the faster water while the most aggressive fish will often move right into the harder current. 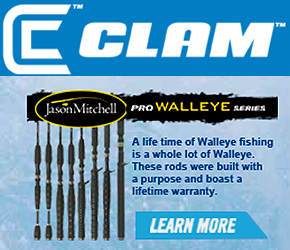 This is why erring on the side of heavy can make us so much more effective when catching river walleye. Now what is heavy? 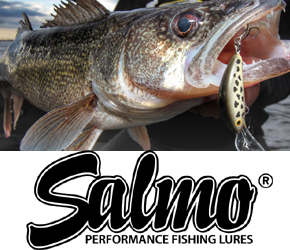 If a ¼ ounce is out of the zone during thirty percent of your drift or cast while performing perfectly during the other thirty percent, upsize to a 3/8 ounce. Increase one jig size to increase your overall efficiency and flexibility. Tungsten is a metal that has become extremely popular in ice fishing and bass fishing applications because tungsten is so much heavier than lead. Of course, a ¼ ounce tungsten jig weighs the same amount as a ¼ ounce lead jig but the difference is the size. Tungsten fishes current extremely well because the reduced size catches less current and is much more sensitive and easier to fish. This heavier metal is also louder when contacting rocks. With good water visibility, I often try to slip as the same speed as the current where the line hangs below the boat and the jigs tumble downstream the same speed as the boat/ current. Pretty straightforward. From this basic way to present jigs are a lot of variables however where you slowly drag upstream, move slower than the current or change the angle of the line where I can not only slide into faster current seams, I have the flexibility to slow down or speed up regardless of what the boat or current does. This is why I absolutely love tungsten jigs for fishing current or rivers. There is nothing better. This past season, we began experimenting with the CPT 365 Drop Tg tungsten jigs and this lineup of tungsten walleye jigs will be available at tackle stores this spring. Tungsten is expensive, but the advantages are worth the cost in my opinion. Besides using tungsten, we had picked the long shank nickel-plated wide gap hook for using soft plastics and double hooking minnows. In our opinion, this is a perfect jig for fishing rivers or current. This season, side on the heavy side. Take advantage of the flexibility tungsten can give you in regard to exact boat control and current so that you are simply more efficient. 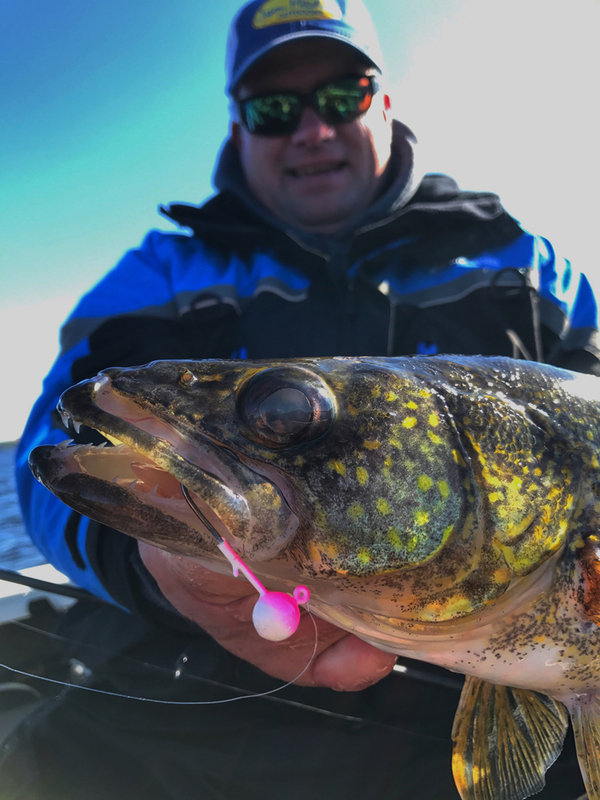 You will catch more walleyes this spring if you can keep your presentation in front of the fish and tungsten does exactly that. Another variable to consider. Compare the virtues of both monofilament and braid. Clear water like what we find below tailraces for example often demand monofilament. There are other situations where mono really shines. I often prefer mono early in the year because I believe the stretch and subtleness of mono gives the presentation a more natural subtle glide through the water. Another consideration is that the stretch in mono hides or masks the unnatural presence in that the fish doesn’t feel the rod or angler on the other end nearly as quickly. On the flip side, braid is more durable and extremely sensitive. Deep water and extremely light pickups can sometimes call for the no stretch of braid. What I often find however is that if I am missing fish particularly when river fishing, make a switch. If I am missing fish with mono, switch to braid. If I am missing fish with braid or not getting bit… switch to mono. Some of the variables include the amount of sag or bow in the line from the current but what so often happens is just how the fish respond to the presence. Do the fish spit out the jig when they feel resistance or choke up on the bait further? Every day can be different but the bottom line is that if something isn’t working with bite detection and batting average (hooking up), switch over. This flexibility can help you catch a tremendous amount of fish. Note that zebra mussels and clams can sometimes dictate the need for a heavier fluorocarbon leader just to keep the line from getting cut or nicked but the braid/ mono switcharoo is important to the jig routine. Keep jigging rods in the boat rigged with both and don’t be afraid to switch back and forth until you find what the fish want. One last tip, when you anticipate slipping with the current where you are fishing below the boat or even slowly dragging upstream and you are needing to adjust to changing depths or current speeds constantly, don’t be afraid to use bait casting rods and reels when you can use two rods. Bait casting reels with a flipping switch allows you to let out line with one hand and the same hand can turn the handle to pick up line. The higher gear ratio of a bait casting reel makes picking up a few feet at a time as easy as half a turn of the reel handle. Much easier to maintain the right bottom contact while holding a rod in each hand.